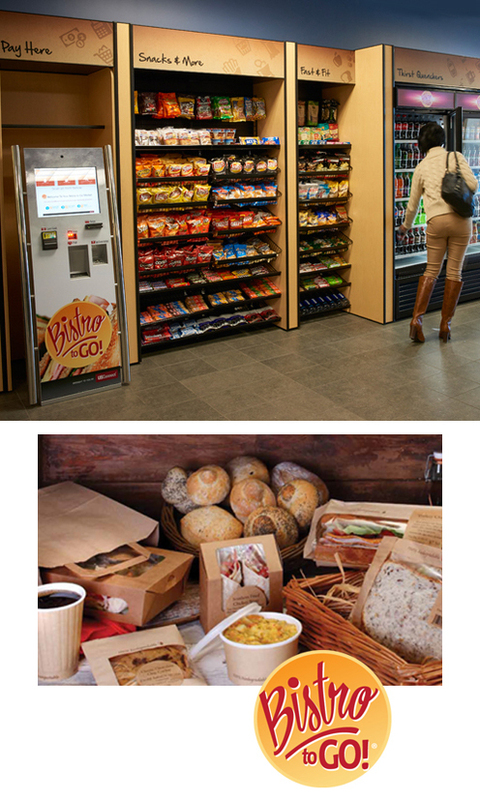 Sometimes called unattended retail or micro markets, our Bistro To Go® kiosks are a brand new way to offer fresh food, coffee and beverages, popular snacks, and other items to employees. Think of it like your own customized miniature convenience store at work! Bistro To Go kiosks are fully customizable; we'll tailor the configuration to the space you have to work with, and blend your Market in with your existing architecture. We stock your Market based on your employees' food and drink preferences and can even stock convenience items like cold medicine, tissues, cough drops, ear plugs, and more. Bistro To Go micro markets feature an array of high-quality, fresh foods, varied coffee and beverage stations, and snack machines—sure to please anyone seeking a convenient alternative to off-site dining. In conjunction with our health and wellness program, The Right Choice... for a Healthier You®, our heart-healthy selections are clearly labeled to help your team make healthy choices. And of course, all purchases earn rewards points through our loyalty program. Just like your favorite local restaurant, we’ll keep the options interesting by rotating food item selections on a regular basis in our clean, well-stocked displays. Take A Break Vending's Bistro To Go kiosks are monitored remotely so we can restock your favorites quickly. Each food product is bar-coded for easy tracking, and our wireless kiosks can be used with a USConnectMe card or the USConnectMe app for ease of use and cashless payment options. The Take A Break team will work with you to design the perfect micro market for your organization. Then, we'll provide and install all the fixtures, cabinetry, and components—from energy-efficient coolers and modern display cases, to security cameras and the self-checkout kiosk. Once installed, we'll be keeping a close eye on your stocking levels so that your market is always full of favorites, always clean, and “open for business.” You'll love the self-service convenience! Take A Break Vending offers a variety of options for unattended retail micro markets. Contact Take A Break Vending today to learn how Bistro to Go unattended retail systems can increase employee satisfaction and improve your bottom line.